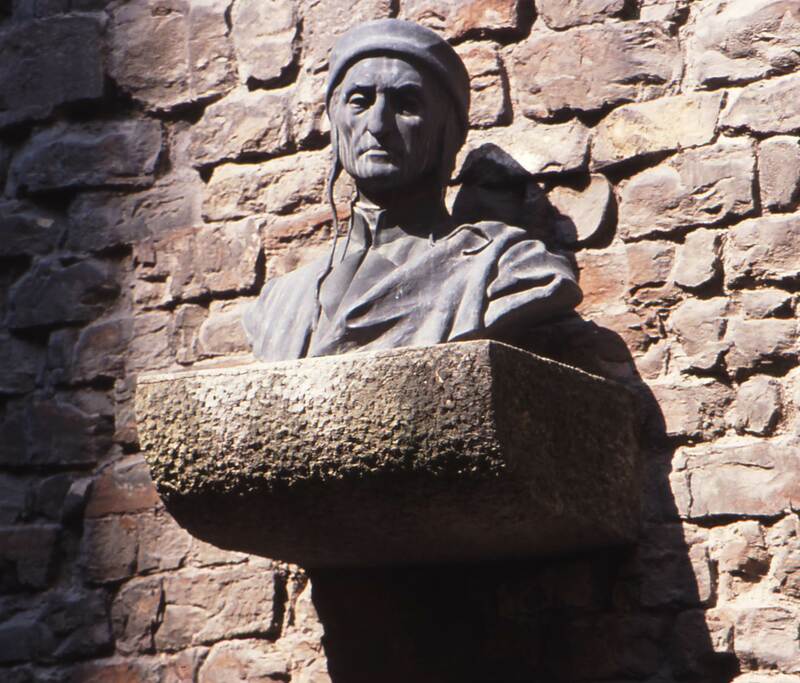 Dante Alighieri (1265-1321) is considered by many the greatest poet in literary history and the grand master of dramatic narrative. While he left a large body of work that came down to us intact, Dante is remembered most for his masterpiece, Divine Comedy. His biographer, R. W. B. Lewis, describes the work as “…all things considered, the greatest single poem ever written; and in one perspective, it is autobiographical: the journey of a man to find himself and make himself after having been cruelly mistreated in his homeland. 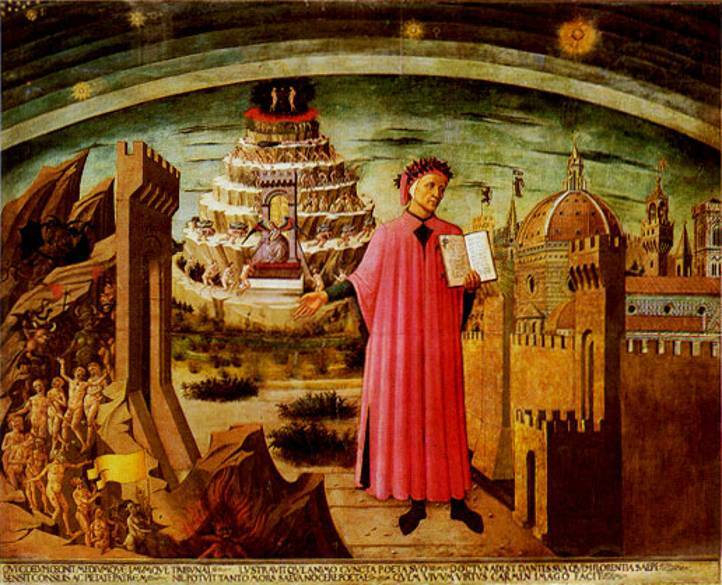 It is also a rhythmic exploration of the entire cultural world Dante had inherited: classical, pre-Christian, Christian, medieval, Tuscan and Florentine.” He titled the piece Comedy as it means a work that begins in misery and ends in happiness. In the tale Dante finds himself “…in the middle of the journey of our life” and “…in a dark wood, where the straightway was lost.” In this confused state a figure appears before him who declares himself to be “…not a man, but a man I once was.” It is the great Roman poet, Virgil, who will guide Dante through two thirds of this three part journey. In the Inferno, Virgil will lead Dante down through nine concentric circles of Hell. Each level contains souls of sinners who are being eternally punished for their acts. As the travelers descend into this pit the sins are more egregious and the punishments more horrific. Punishment is being meted out for carnal sin, gluttony, avarice, heresy and others until the ninth circle. Here is the level of the most damned. These wretched souls have committed the worst sin – treason. 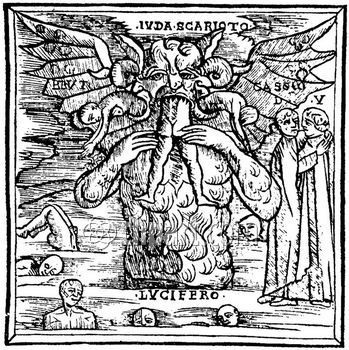 It is here Dante and Virgil come face to face with Satan, a three-headed monster buried chest high in ice (quite a different image of the current belief of Hell as a place of fire and brimstone.) In each mouth he is eating a soul whom Dante considers the most despicable traitors. Brutus and Cassius, betrayers of Julius Caesar whom Dante considered a divinely appointed ruler and potential savior of a unified Italy, are in the left and right mouths, respectively. In the center and most vicious mouth is Judas Iscariot, betrayer of Jesus. So where does the dwarf planet Pluto fit in. Strangely enough, it appears that Dante is not only the greatest of poets but he is also prescient. 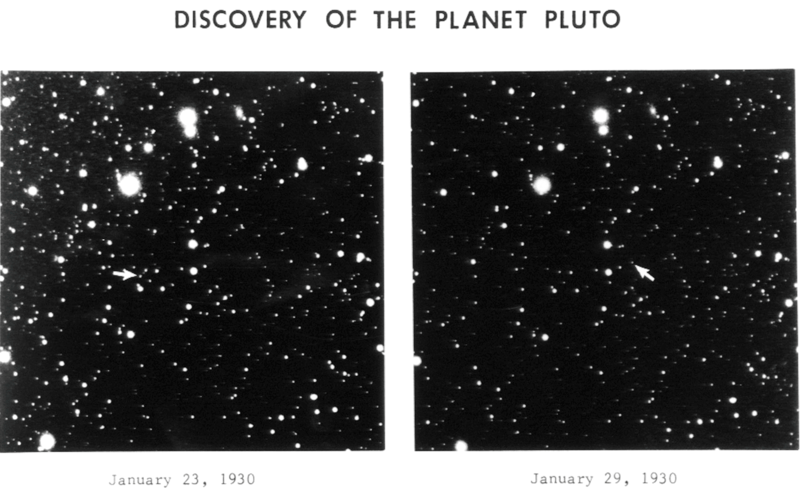 Dante died in 1321, exactly 609 years before the discovery of Pluto by Clyde Tombaugh of the Lowell Observatory in March of 1930. Yet his description of Inferno is almost exactly the same as the climatic conditions on the planet. Pluto, named for the classical mythological god of the Underworld, and its five moons are 3.7 billion miles from the Sun. The ambient temperature is minus 375 degrees. The orb is basically a giant ball of ice, not unlike Dante’s Hades. Its five moons are geologically the same as the planet. Interestingly enough they bear names from the Underworld. 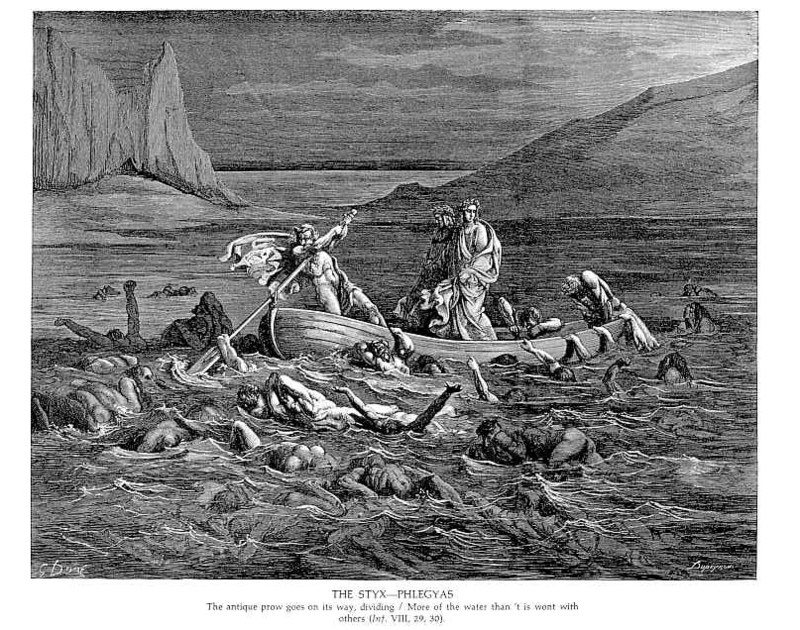 Charon is the ferryman of Hades who carries the souls of the newly deceased across the rivers Styx that divided the world of the living from the world of the dead. A coin was placed over the eyes or in the mouth of the cadaver to pay for passage. Some believe that those who could not pay the fee or those whose bodies were left unburied, had to wander the shores for one hundred years. 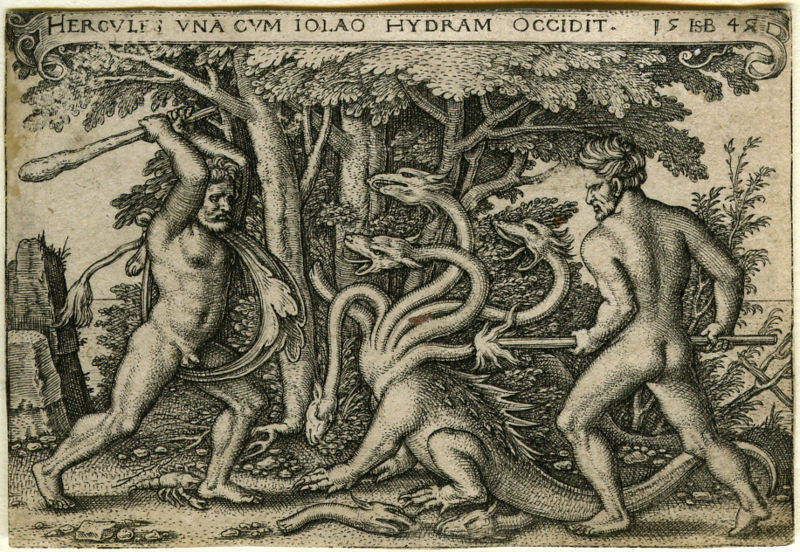 Hydra is the nine-headed serpent that Hercules battled in ancient mythology. 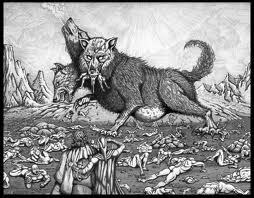 Kerberos is the three-headed hellhound that guarded the entrance to the Underworld in ancient mythology in order to prevent souls from ever escaping. Nix is the Greek goddess of darkness and night and the mother of Charon. Styx is the river across which souls are ferried to the underworld in Greek mythology. It is the river of hate and it is derived from the Greek Stux.